Triglycerides -- a specific type of lipid, or fat -- function as storage units for excess calories. When energy levels drop between meals, hormones signal the release of triglycerides from your fat cells. Overeating can cause excessive triglycerides in your blood, a condition that contributes to artery-narrowing plaque and increases your risk of heart disease. Knowing which foods raise triglycerides can help you to make healthier choices. Oatmeal, a whole-grain food, contains fiber-rich oat bran that may affect your triglyceride and cholesterol levels. Triglycerides and cholesterol -- a waxy substance made in your liver -- move through your body by way of fat-transporting proteins called lipoproteins. High triglyceride levels are usually found together with other unhealthful conditions such as high blood pressure, high blood sugar, excess abdominal fat and high cholesterol. They can also result from medications and certain diseases. Elevated triglycerides -- a condition with the tongue-twisting name of hypertriglyceridemia -- can be detected with a lipid profile, also called a lipid panel. Cleveland Clinic advises having a baseline lipid panel at age 20, to be repeated every five years. To help lower triglyceride levels, your doctor may advise lifestyle changes such as losing weight, exercising and limiting your intake of high-cholesterol foods, saturated fats and refined sugar. According to the USDA National Nutrient Database, a 1/2-cup serving of oats, prepared with water, provides 2.97 grams of protein, 1.78 grams of fat, 14.04 grams of carbohydrates, 2 grams of dietary fiber and 0.32 grams of natural sugars. 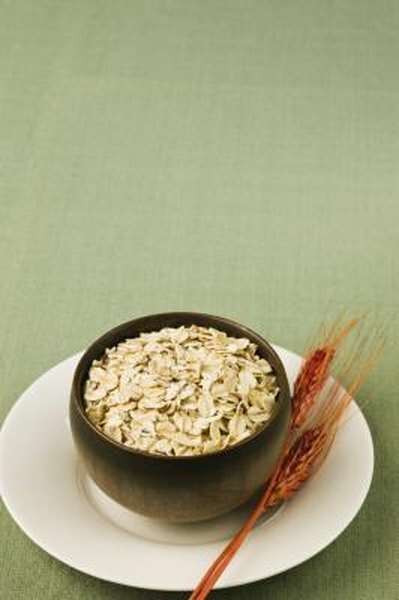 Oatmeal is low in fat, low in salt, high in fiber, devoid of added and refined sugars and cholesterol-free. At a reasonable 83 calories, a 1/2-cup serving provides a modest amount of protein, healthy levels of dietary fiber and assorted vitamins and minerals. Not only is oatmeal not bad for your triglyceride level, it may even help to reduce it. Whole-grain foods, such as oatmeal, take longer to digest than refined grains, which helps to regulate blood sugar levels and causes fewer triglycerides to be released. In a review published in 2008 in "Vascular Health Risk Management," the authors evaluated clinical and animal studies to determine the effectiveness of beta-glucans -- a type of polysaccharide fiber found in oats -- in treating diabetes and its contributing factors, which include hypertriglyceridemia. They concluded that beta-glucans are effective in decreasing hyperlipedemia -- a general term for excess fats in the blood -- and noted that oat beta-glucans reduce low-density lipoprotein cholesterol while increasing levels of healthy high-density lipoprotein cholesterol. They also credited oat beta-glucans with appetite-reducing effects, which could help control the excess calorie intake that contributes to high triglyceride levels. A 1/2-cup serving of oatmeal also provides 0.26 milligrams of niacin, or vitamin B-3. In addition to producing energy, niacin helps to lower triglycerides and LDL cholesterol. The same serving of oatmeal contributes 90 milligrams of the essential mineral phosphorus -- necessary for strong bones and teeth -- along with 1.17 milligrams of zinc, essential for proper immune system functioning. Finally, a 1/2-cup serving of oatmeal provides 0.68 milligrams of manganese, a trace mineral essential for the production of superoxide dismutase, a potent antioxidant enzyme.